(Newser) – Step aside, Billy Mitchell—the new “King of Kong” is New York City plastic surgeon Hank Chien, who beat Mitchell's Donkey Kong scoring record by 10,000 points. The arbiter of Donkey Kong scoring, Twin Galaxies, has verified Chien’s score on the classic arcade game. The real shocker: The doctor has been playing the game only since last September. “It’s something to add to my resume,” says the Harvard grad. Chien was turned on to the game by the 2007 documentary King of Kong, which documented Mitchell’s fight to hold on to his record against another interloper. “This film made me realize there was a whole group of people that were playing the classics,” he tells the New York Daily News. The feat occurred during a February snowstorm, when Chien took the day off to attempt the record on the machine he keeps at home. "It's something I can be proud of," Chien says. 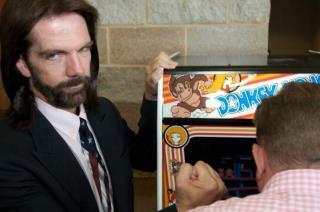 Haha Take that Billy Mitchell!